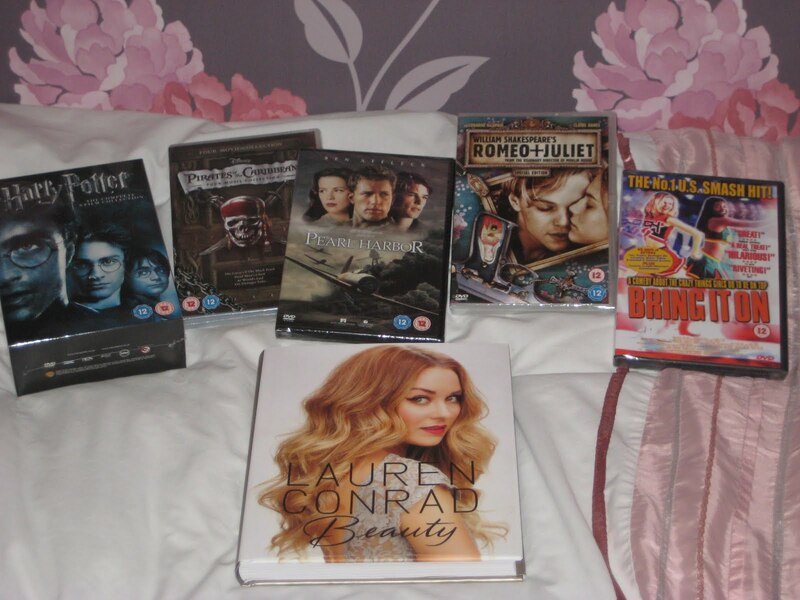 Everything But The Kitchen Sink: Film Nerd! So as a Christmas bonus my work gave me a £50 amazon voucher, which was very generous of them! I don't normally buy my dvds from amazon as most of the time they're a lot more expensive, but surprisingly I did find a good few bargains! Going from left to right, the box set of harry potter dvds was on top of my list as my sister is taking her set with her to her new house. All 8 dvds came to... drum roll.... £20! So cheap for all of them! Next is the four Pirates of the Caribbean dvd set, another favourite! Plus Johnny Depp and Orlando Bloom aren't that bad to look at, although nothing can beat Heath Ledger in that! 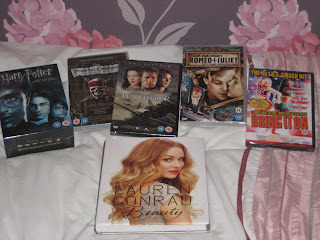 I tried to look a Disney film box set but they were sooo expensive, I mean £100 + :( I also got Pearl Harbour, a classic film. I hadn't actually watched it until about a year ago but now I love it! After studying Romeo and Juliet in English a few years ago then watching this film, its up there with Titanic as one of the best romantics. Bring It On is a guilty pleasure, it's just cheesy and over-the-top happy! haha. The last item is Beauty by Lauren Conrad, which from flicking through so far looks like its going to be helping me out a lot! I've got her style book and that's been so helpful with everything, so hopefully this will live up to my expectations! Have any of you guys got a favourite film? AH you got the LC book too. We are obviously partners in awesome book taste. It's surprisingly good! I'm now obsessed with the bun that makes you look a bit like you have a pineapple on your head with crazy bright lipstick - so much easier than I thought it would be!